In an article posted to the ESPN Pac-12 Blog on July 2, Travis Haney delved into the question marks surrounding the top teams in each division of the Power 5 conferences (ACC Atlantic and Coastal, Big Ten East and West, Big 12, Pac-12 North and South, and SEC East and West). For his section on the Pac-12 North, Haney naturally elected to focus on the most electrifying team in the sport: the Oregon Ducks. Plenty of questions surround the program coming off a berth in the inaugural College Football Playoff, as the team is noticeably without several key components from last year’s runner-up squad. The departure of Heisman Trophy-winner Marcus Mariota to the NFL looms largest, but several other departures (especially on defense) are noteworthy. Arik Armstead, a 2015 first round pick of the San Francisco 49ers, and Ifo Ekpre-Olomu, an ESPN 1st Team All-American in 2014, have both moved to the NFL as well. However, as Haney notes, Oregon is uniquely set up to survive this year’s talent exodus, due to both the existing depth at important positions and the arrival of a number of talented transfers. Royce Freeman breaks free against Washington. 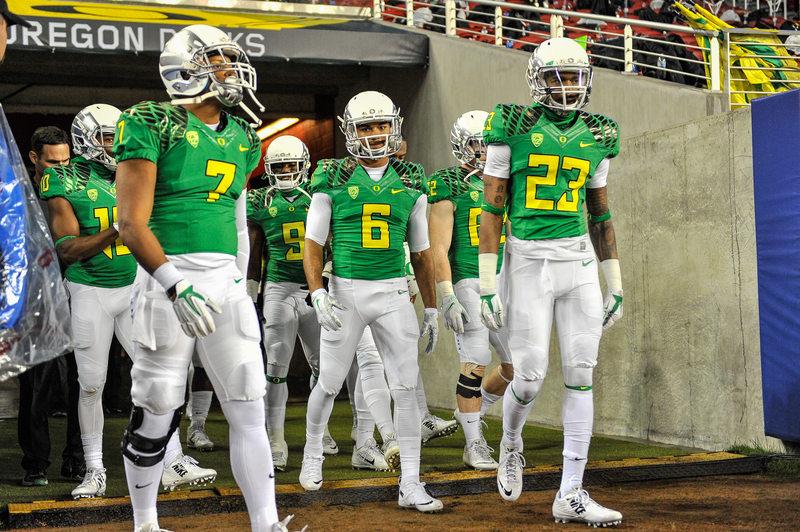 “What makes Oregon stand out is its returning skill talent,” Haney writes. 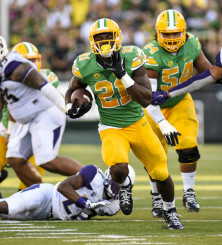 He singles out running back Royce Freeman, who is expected to be the Duck workhorse this fall. Haney also points to a stable of wide receivers, including Olympic-level speedster Devon Allen, and Darren Carrington, who had a number of huge games late in the 2014 campaign before a failed drug test left him on the sidelines for the National Championship Game. However, Haney fails to mention the return of running back Thomas Tyner, who ran for 124 yards and a pair of touchdowns in the Ducks’ Rose Bowl victory over Florida State. Tyner is as talented as nearly any running back in the conference and features a plethora of shake-and-bake moves that make him a fantastic complement to the more deliberate and pounding Freeman. If there is any doubt of Tyner’s talent, check out the nasty spin move he pulled on Stanford’s Jordan Richards, who was a 2015 second-round pick of the Super Bowl champion New England Patriots. The combination of Tyner and Freeman gives the Ducks a running back tandem as talented as any in Oregon history, including the electric duo of LaMichael James and Kenjon Barner during the 2011 season. The talent at running back and receiver should ease the transition out of the Mariota era, but the question still remains: who will succeed the greatest Duck to ever wear the uniform? Haney seems convinced that Eastern Washington transfer Vernon Adams is the clear choice. Many are inclined to agree, as Adams brings big-time playmaking ability with him from the Eagles. In his redshirt sophomore season, Adams threw for 55 touchdowns, nearly 5,000 yards, and was runner up to Eastern Illinois’ Jimmy Garoppolo (now heir-apparent to future Hall of Famer Tom Brady) for the Walter Payton Award, the FCS equivalent of the Heisman Trophy. Haney notes Adams has career numbers of 121 total touchdowns and more than 10,000 yards passing in three seasons. 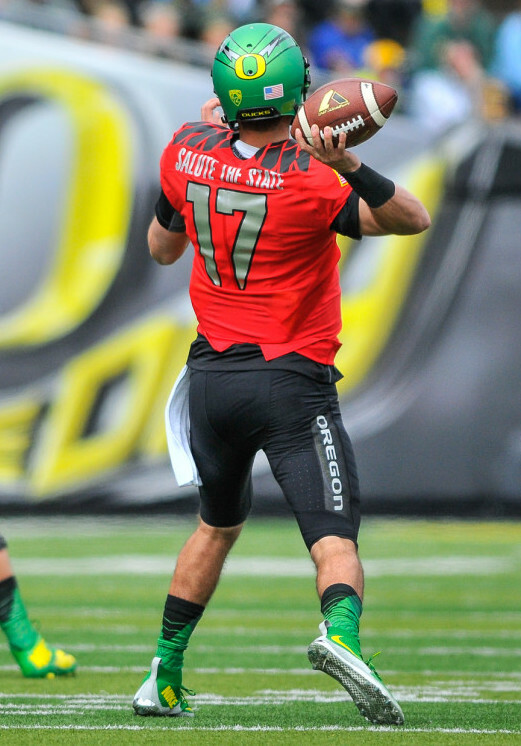 Jeff Lockie in action during the 2015 Spring Game. While he may be the most gifted passer on the roster, Adams will face stiff competition for the starting quarterback job from a host of in-house candidates, led by redshirt junior Jeff Lockie. Lockie has previously appeared exclusively in mop-up duty for the Ducks, simply managing games that have long been put out of reach by Mariota and company. However, he has been solid in that role and knows the system. He really opened some eyes at the annual spring game, showing great command of the offense. Lockie was a perfect 9-for-9 in the spring game, throwing for 223 yards and 3 touchdowns. Although this game is essentially a glorified scrimmage, Lockie was able to showcase his abilities to the fan base as well as the coaching staff, causing some, including the Oregonian’s Andrew Grief, to wonder if he may open the season as the orchestrator of the Ducks’ high-octane attack. While questions certainly remain on the defensive side of the ball (who replaces Armstead? How do the Ducks avoid getting gashed on the ground like they did in the National Championship Game? Who steps up in the secondary? ), it looks like the Ducks are poised for another run at the playoff behind a revamped offense and the sting of defeat still fresh in their minds.